I was recently invited by the Mexico City Tourism Office to for a quick three day visit to Mexico City. For me? 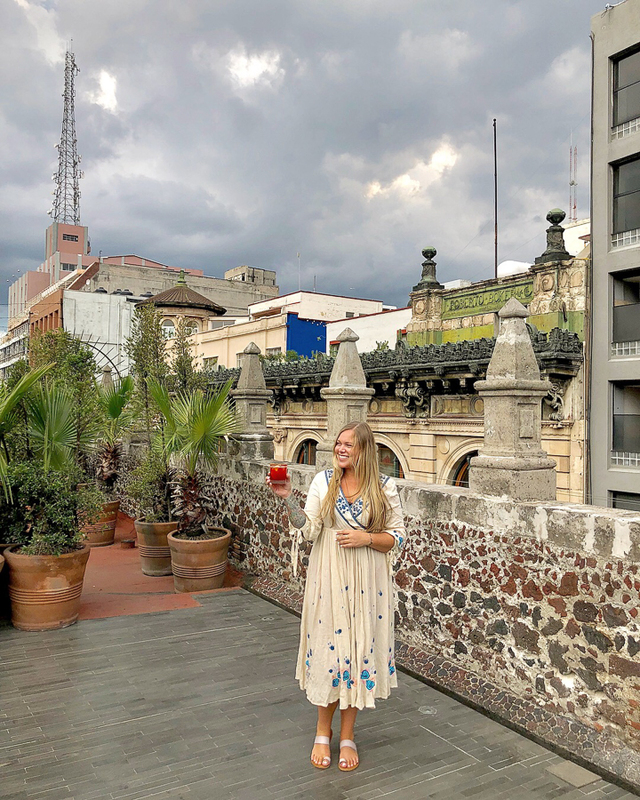 It only took about three hours to fall in love with Mexico City and before laying my head down to sleep on the first night – I was already dreaming of my next trip to CDMX (Ciudad de Mexico). 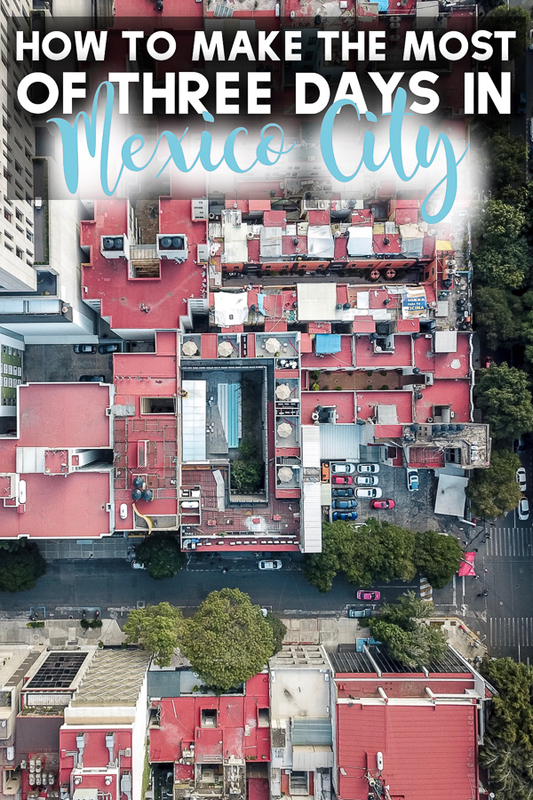 Home to over 21 million residents – Mexico City is the largest metropolitan area in the entire Western Hemisphere and it’s also the largest Spanish speaking city in the entire world. With 16 official boroughs and a land mass of over 1,400 square kilometers (or over 570 square miles) – Mexico City is truly massive. But! Fret not, with this helpful guide you’ll be able to make the most of your three days in Mexico City! 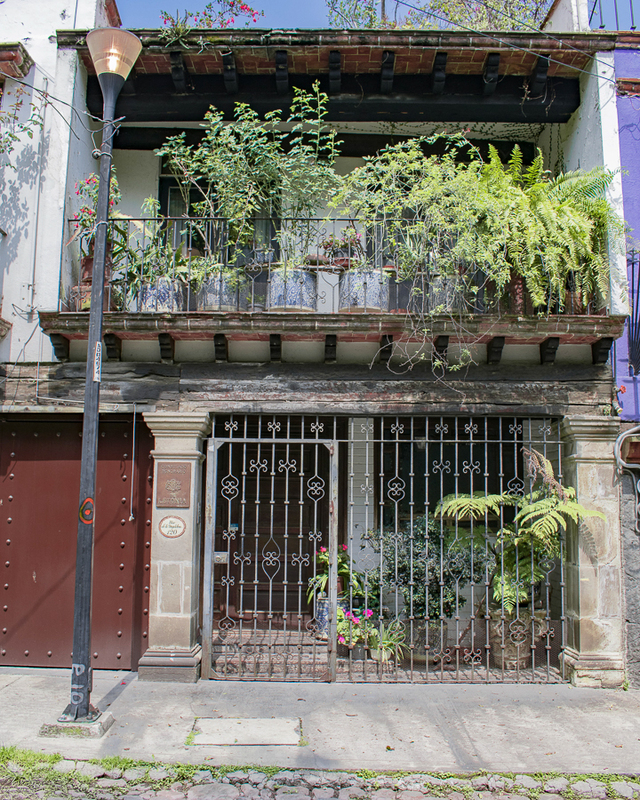 Built for the 1968 Olympics, the Camino Real Polanco is an architect lovers’ dream property. From the caldera-shaped fountain in the property entrance to the exterior that channels a pre-Hispanic pyramid (making a nod to the city’s past) – the entire property pays homage to a Mexican modernist style. The interior also boasts murals, sculptures and art-works all around the property – sporadically placed amongst the 700+ guest rooms, 11 restaurants and over 30 meeting rooms. 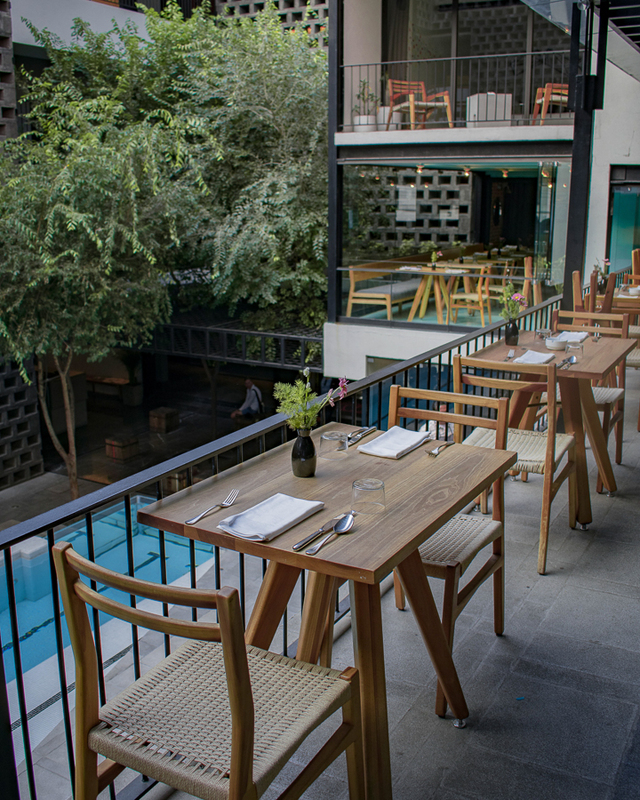 Not only does the Camino Real Polanco have all the history and design one could hope for in a hotel – but also at no shortage of other services and amenities. One of my favorite parts of Mexico City can even be seen from the plane window as you land – THE COLORS. Mexico City is such a vibrant city! 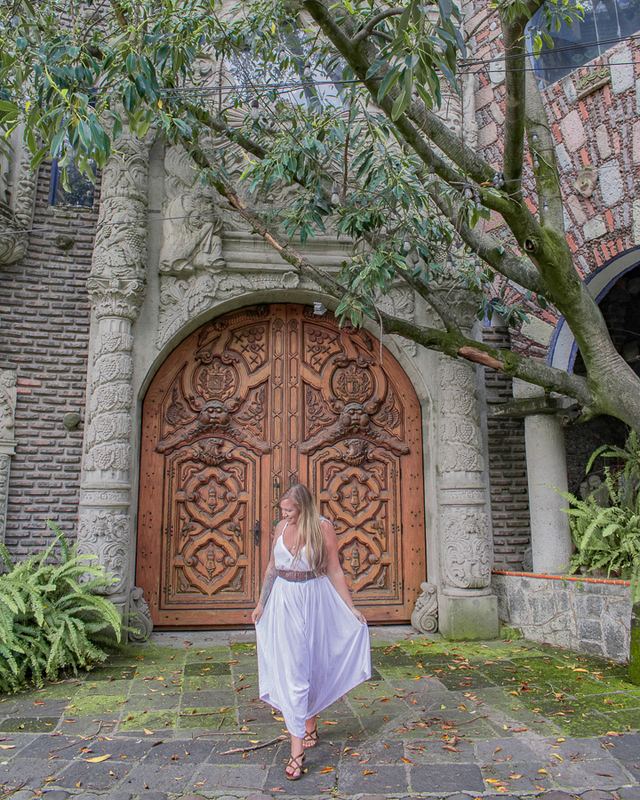 I can’t suggest putting down the map and getting wanderfully lost in the streets of Mexico City. 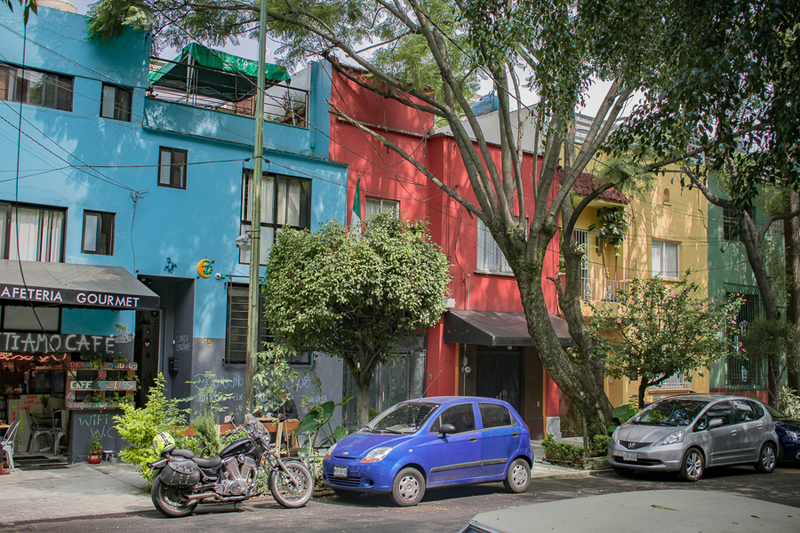 The Roma, Condesa and Coyoacán were hands down my favorite areas of the city to walk around and photograph. Some snaps from exploring the Chimalistac area of Mexico City. 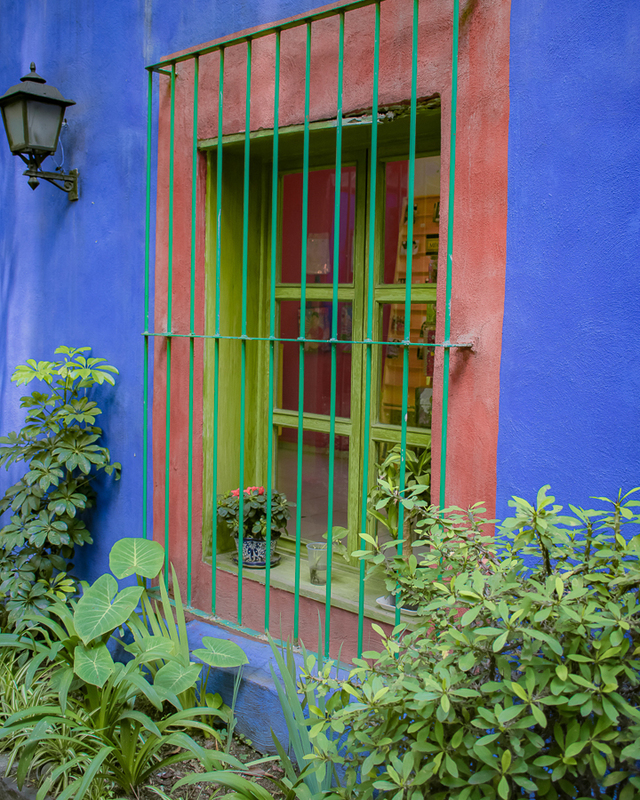 Bright colors adorn facades on almost every street in Mexico City! 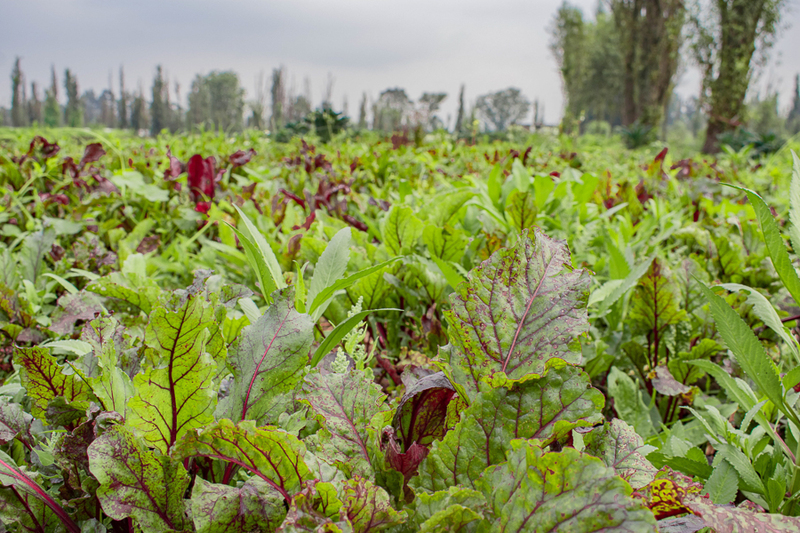 The founders of Yolcan have been working with the farmers of Xochimilco to preserve the traditions of farming the “chinampas”. 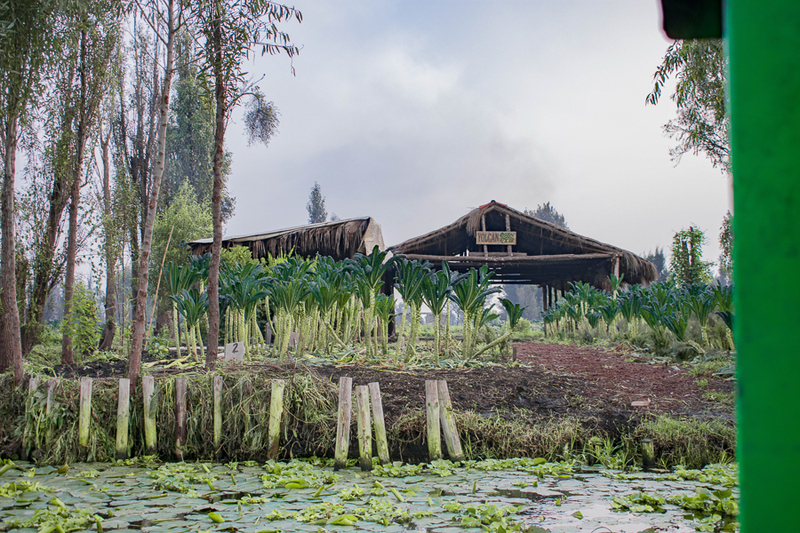 The chinampas date back to the Aztec’s and are artificial islands that are built on the shallow lake beds of the valley. 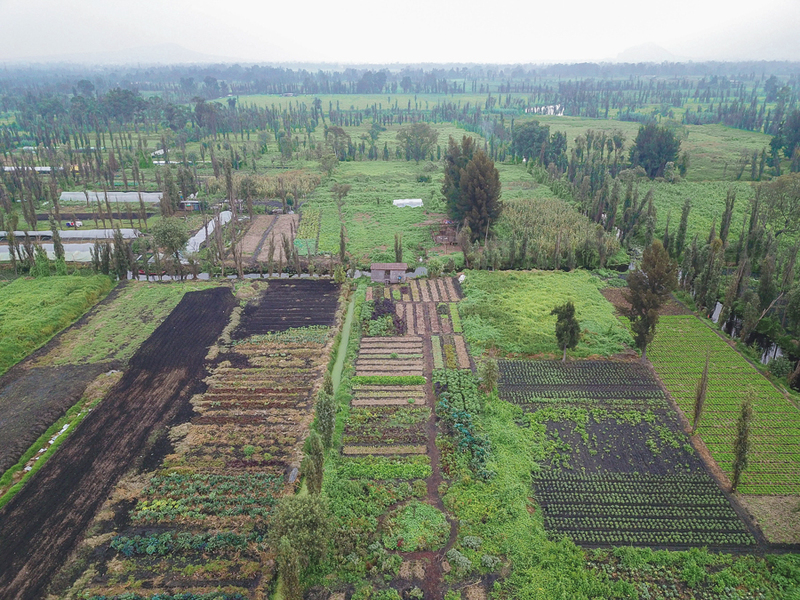 From there it makes the land easy to cultivate for farming and what’s even better is that the team at Yolcan is preserving organic farming in the chinampas! 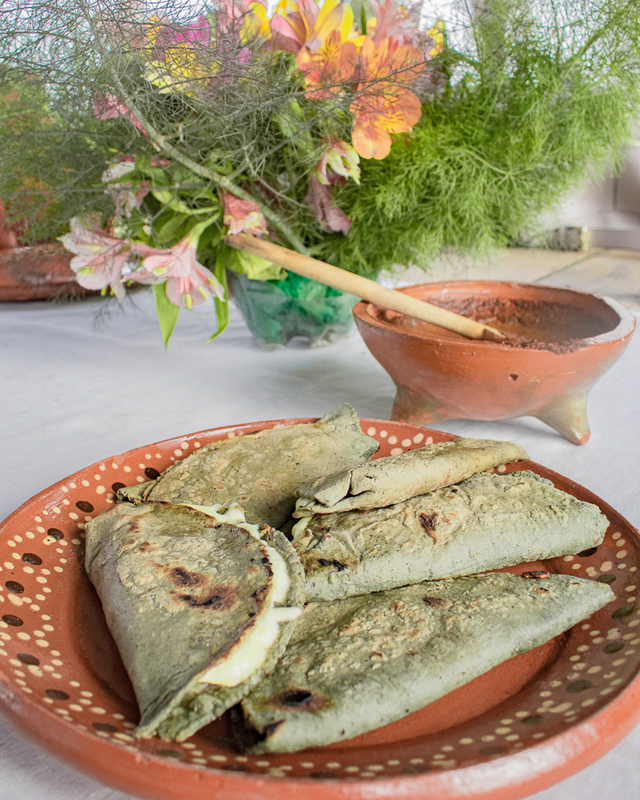 Local restaurants and chefs source anything from tomatoes to lettuces and herbs from the privately owned chinampas – in turn saving the tradition of farming in the area. 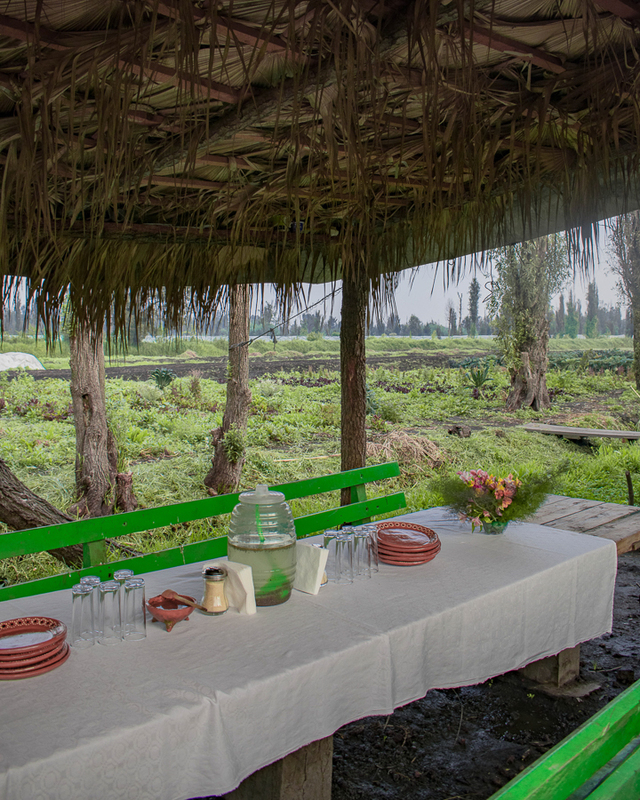 We took a trajinera ride through the floating gardens to a privately owned chinampa where the owners prepared a traditional breakfast while we learned more about the area and the traditions. 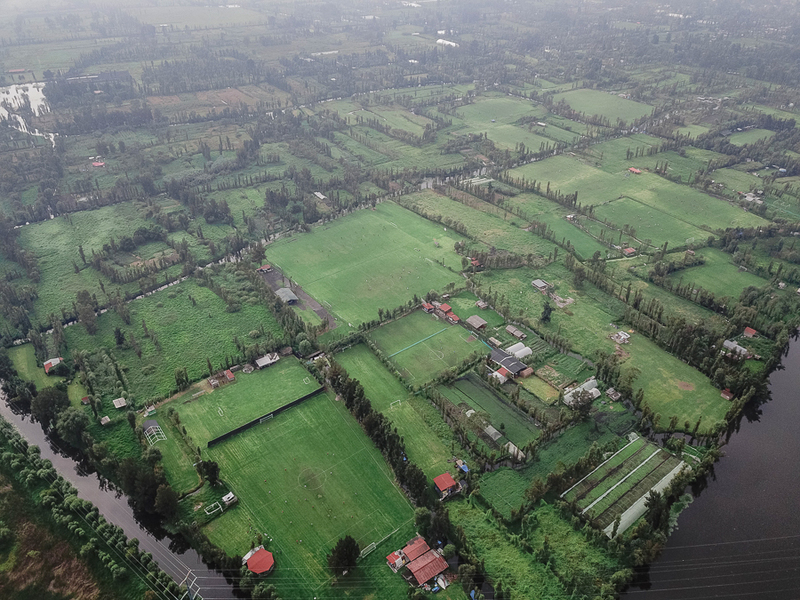 A bird’s eye view of the chinampas and the farms. (left) pulling up to the Yolcan chinampa and (right) some of the lettuces they’re growing. (left) The traditional – and delicious – breakfast we had and (right) the beautiful breakfast spread that awaited our arrival. When the Aztec’s built the original city of Mexico-Tenochtitlán – they built it on top of the lake, Lago de Texcoco. By placing soil in the middle of the lagoon – they created the initial foundations of the city. When the Spanish conquered the Aztec capital in 1521 they built modern Mexico City right over the ruins of Tenochtitlan. Today, Zócalo, Mexico City’s main plaza (and one of the largest in the world) houses the Ruins of Templo Mayo which is said to be the most important temple to the Aztecs. The site is said to have been built in the exact location where the Aztecs saw an eagle peaching on a cactus with a snake it its beak – a symbol that is now the symbol of Mexico and can be seen on their flag! While it’s somewhat upsetting to see how the Spanish conquistadors built their colonial era cathedral right on top of the Templo Mayo ruins – it’s also extremely impressive to see the history transition right before your eyes. The stones used to build the Catedral Metropoloitana were even taken right from the ruins of the Templio Mayo ruins. No, the photo wasn’t taken on a tilt – the buildings are actually sinking into the ground! There are heaps of local markets around Mexico City selling any and everything from local fruits and vegetables to Spanish-inspired tapas to leather shoes and woven baskets and there’s certainly no shortage of color! La Ciudadela market is a local artisan market that celebrates the traditions, colors and creativity of Mexican artisans. You can find local arts and crafts from all over the country of Mexico at La Ciudadela market. After working up an appetite from shopping at La Ciudadela – make you way over to Mercado de San Juan where you can find almost anything to cater to a variety of palates. From fresh fish counters to fruit stands to unique meat offerings (think: alligator, iguana and scorpion) to imported European meats and cheeses – this is a place for foodies to revel in. Come hungry and leave ready for a siesta. Mezcal is a type of alcohol that is made from the native-Mexican plant, agave. 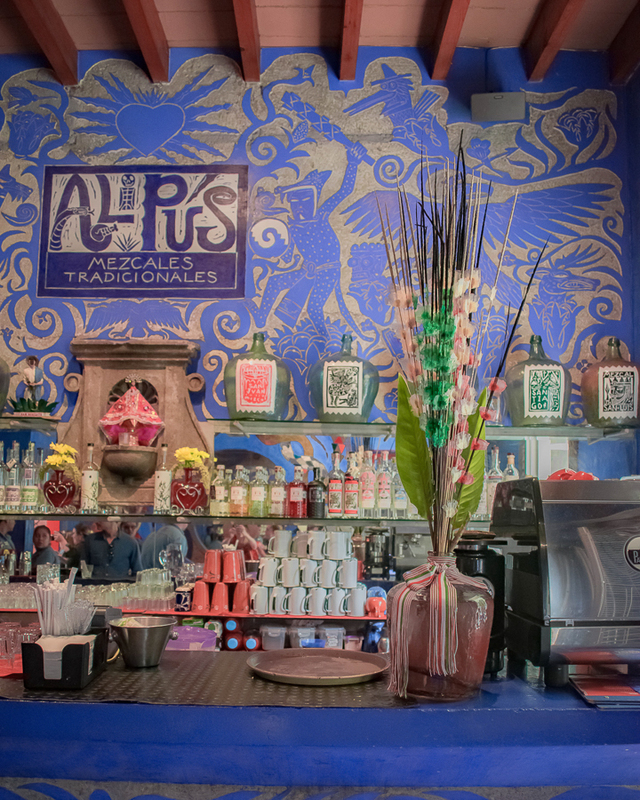 While tequila is wildly associated with Mexico – it’s said that Mezcal is the true spirit of Mexico. What better way to pay homage to the spirit of Mexico than by tasting it? Make sure to taste your mezcal like a true local and pair it with sal de gusano (worm salt) a bit of insect protein mixed with salt made from the ground up worm larvae that feed on the agave plant. Wash down your mezcal with agua de Jamaica (essence of hibiscus – a refreshing and floral sip for after a swig of mezcal). We had our mezcal tasting at the beautiful Corazon de Maguey – a self-proclaimed “la catedral del mezcal” or mezcal cathedral. The bar at Corazon de Maguey was so pretty! 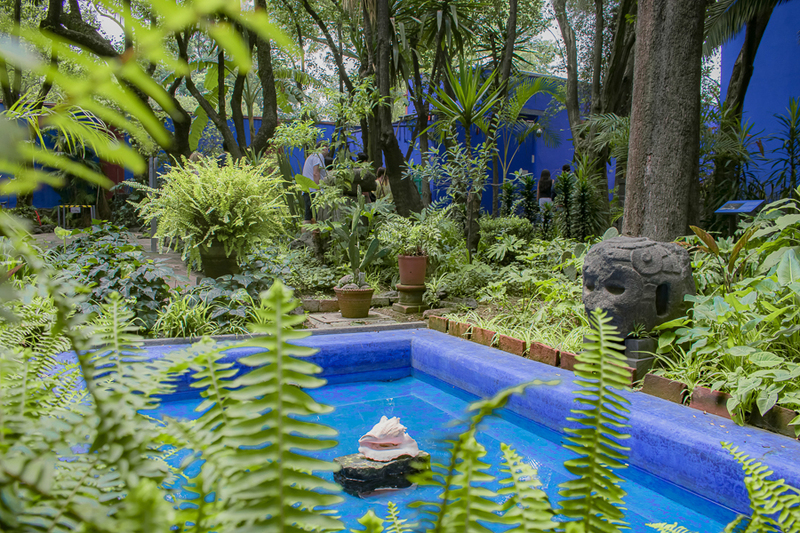 One of Mexico City’s most famed residents is the late Frida Kahlo – known best for her self-portraits, Kahlo grew up in the Coyocán area of Mexico City and her blue home, Casa Azul, is now home to a museum that preserves the space, artwork and belongings of Kahlo. 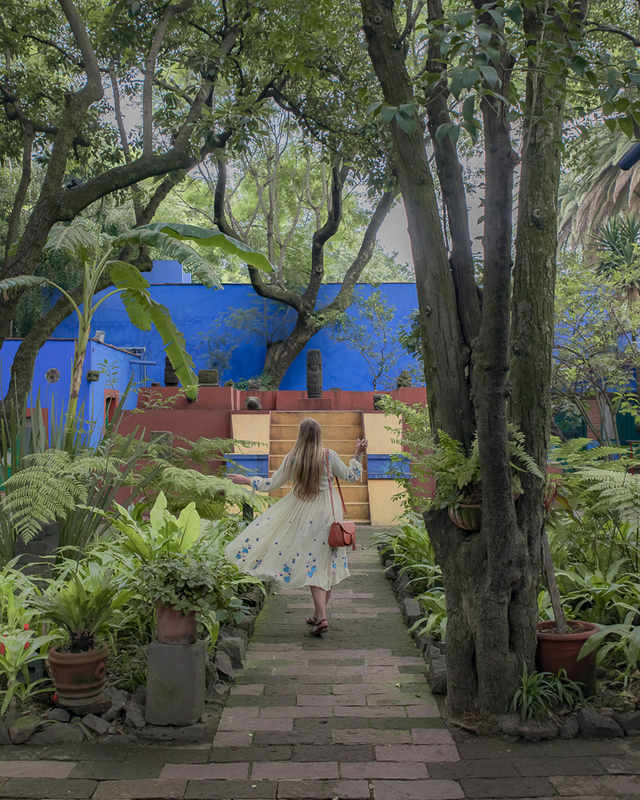 When touring around the home where Kahlo was born and where she lived (and died) you can feel and see the connections between the home she was so attached to and the art that she became famous for creating. 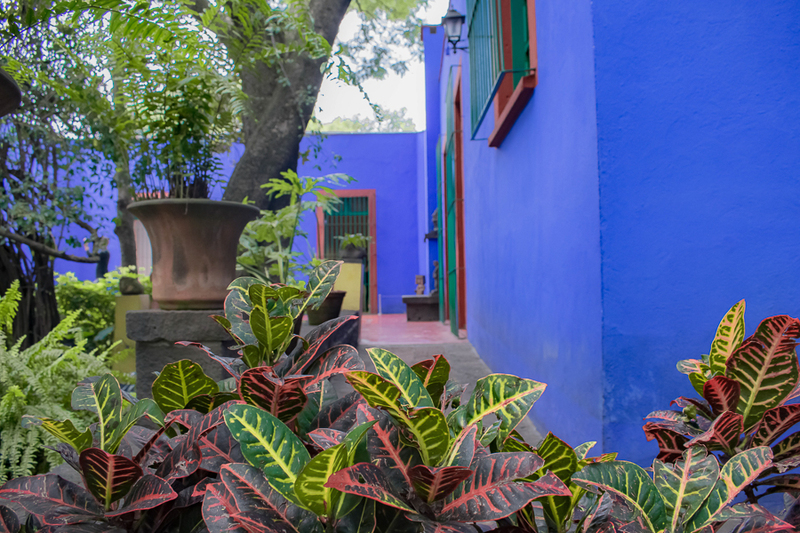 I could have photographed blue hues and lush gardens at Casa Azul for days. (Left) Even the wall inside the gift shop was a photo op and (right)and the façade of the giftshop itself was photogenic. And don’t forget to stop and twirl on your way out! (Photo by Haley from @readysetjetset). I mean, c’mon, it’s Mexico – of course tacos, sopes and all the Mexican dishes are on the itinerary. I’m not ashamed to say that I indulged in different bites each day during my trip in Mexico City. From breakfast in Condesa at Pasillo de Humo to the local spot in Roma Norte, “El Parnita” (a no-frills space known for its tacos packed with locals) to the traditional bites at Azul (a bit more upscale, yet still casual restaurant in the Downtown Mexico building – there’s no shortage of delicious eats and you almost can’t go wrong when trying new Mexican flavors. 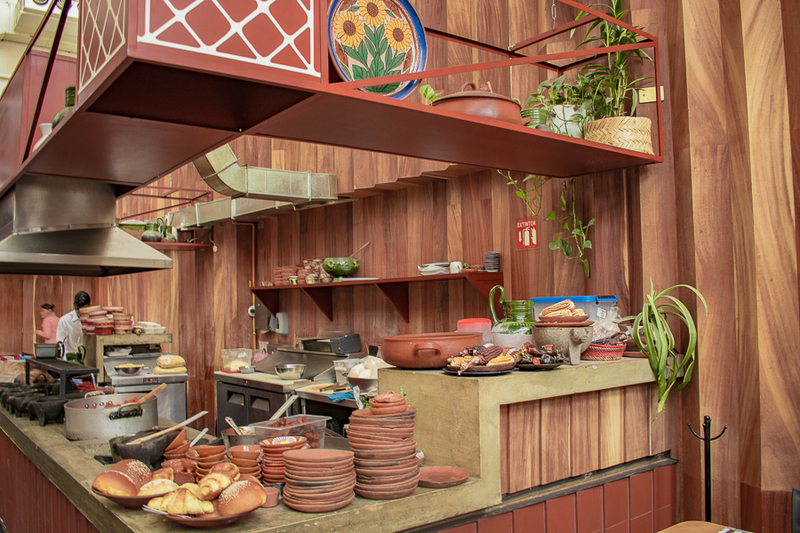 I loved the open kitchen at Pasillo de Humo. 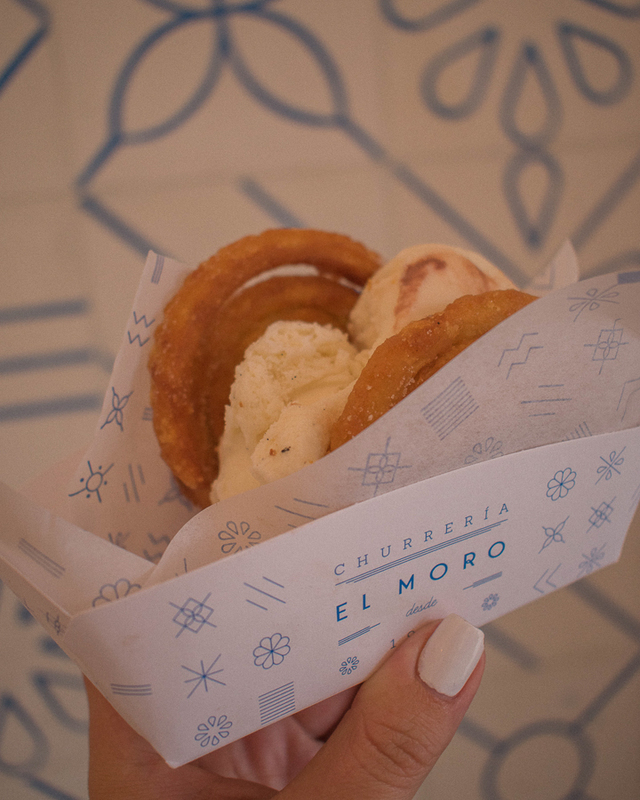 For Instagram worthy bites dine at the restaurant overlooking the pool at Hotel Carlota (left) or snack on an ice cream sandwich in between fresh churro (cooked up in the perfectly blue and white tiled El Moro Churrería. The local art can be seen all around the city – from curated murals to architecture – art is everywhere in Mexico City. 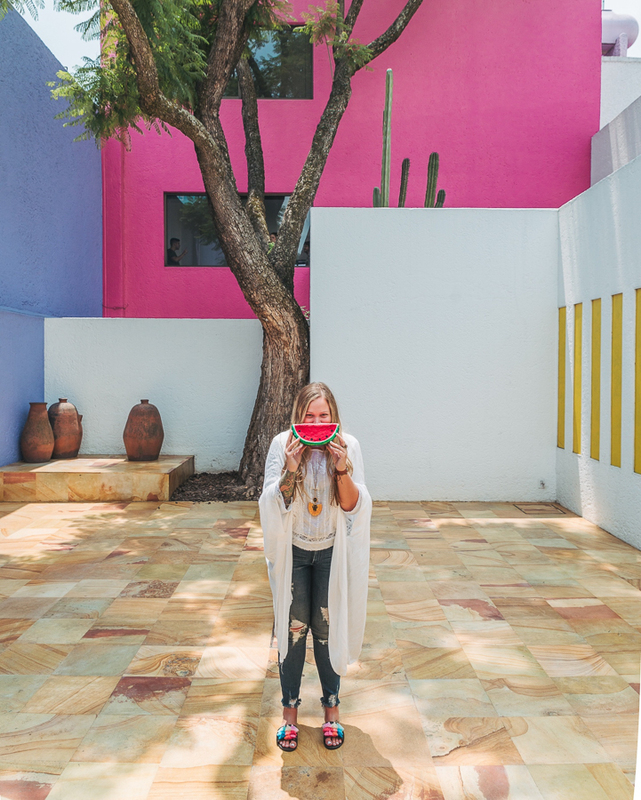 A great way to dive into the local art scene is to take a tour of Luis Barragán’s Casa Gilardi. The home was built to help the visitor evoke emotion and the genius play on colors, light and water truly left my soul feeling warm and fuzzy. 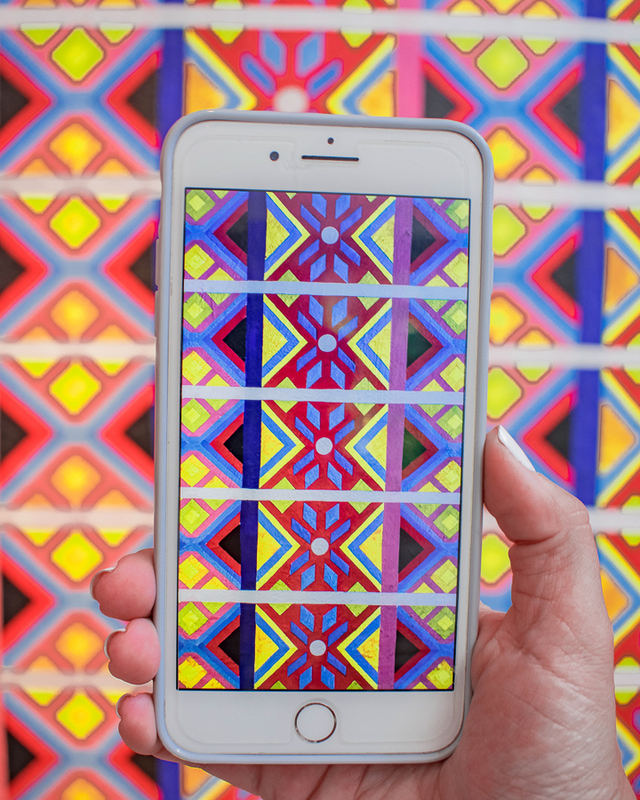 What better way to experience the city’s art scene than to literally walk through it? Casa Gilardi make me smile bigger than I can say. 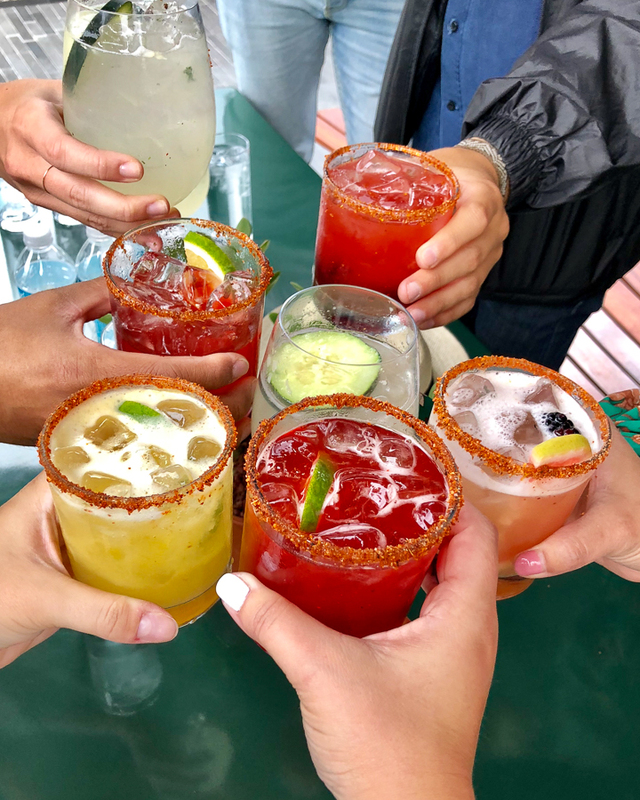 What’s the only thing better than good drinks with friends? Good drinks with friends, in a pretty space, with an awesome view – of course! 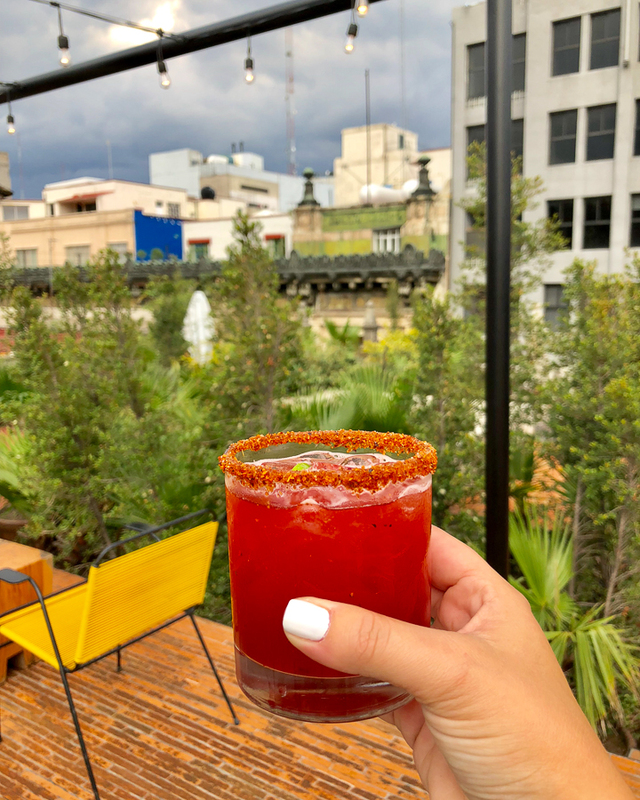 Check out the rooftop at Downtown Mexico for some views and hues and especially for their delicious and trendy cocktail menu. 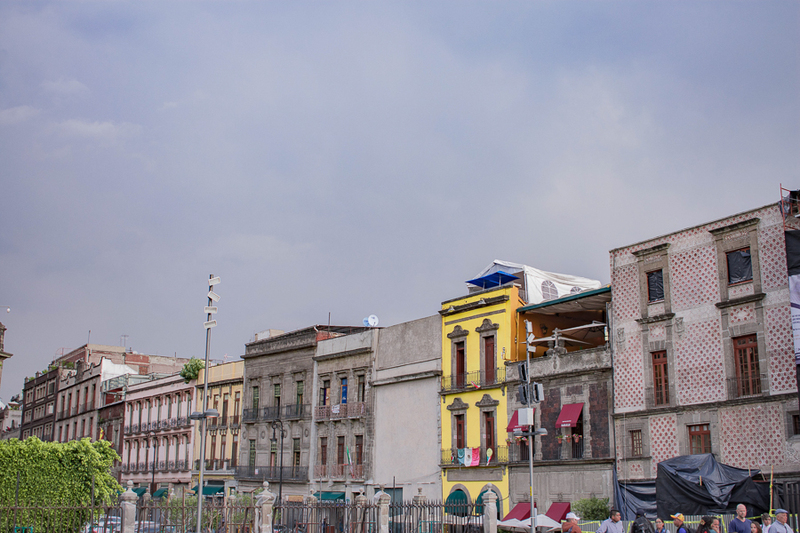 From the art to the cuisine which both play a large part in Mexico City’s history – to the architecture and the culture, there’s no shortage of things to do in Mexico City. 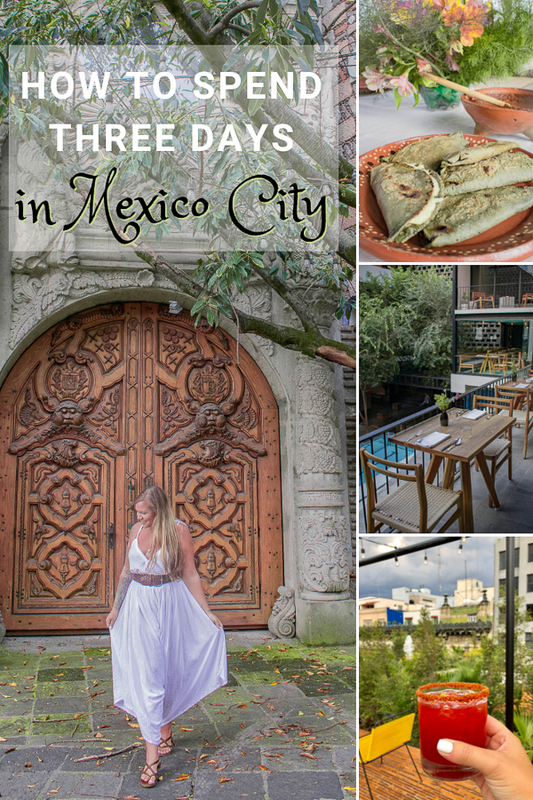 I highly suggest creating your three-day Mexico City itinerary with have some free time, as you may stumble upon an area you’d like to explore more than you initially planned for or you might find yourself lost in conversation with locals. 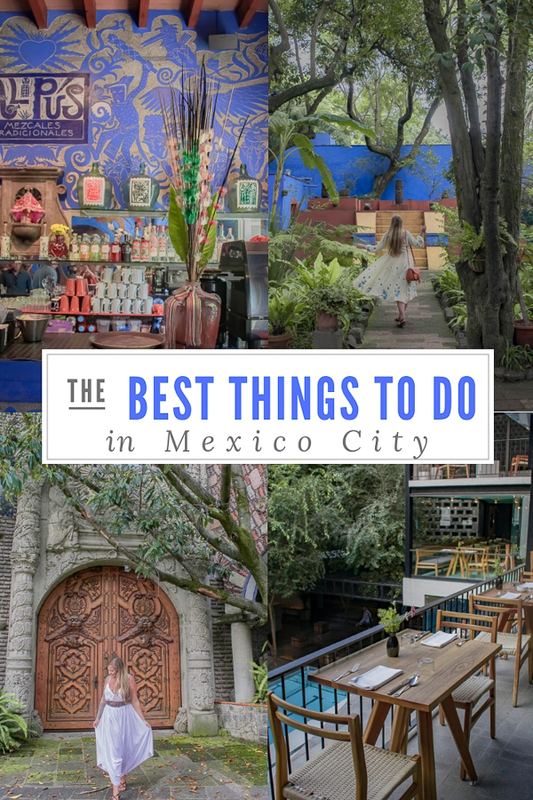 No matter how you decide to spend some time in Mexico City – you almost can’t go wrong! 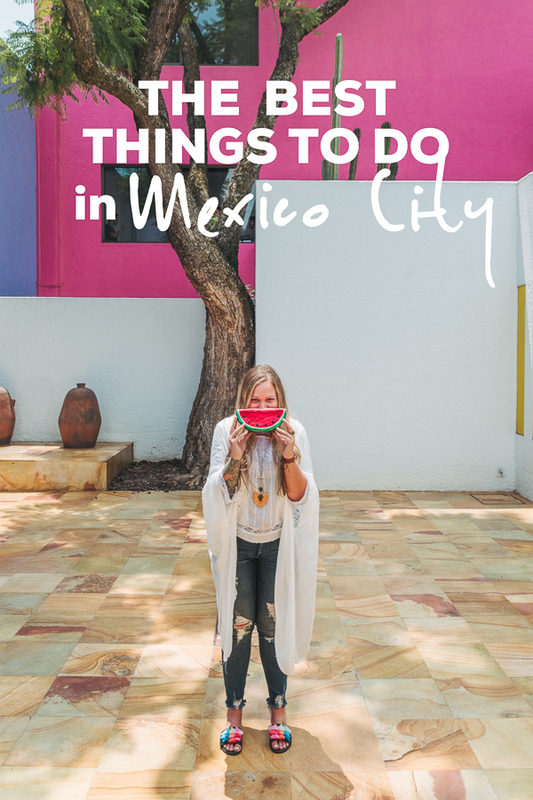 Have you recently traveled to Mexico City – what would you add to my list of “must-do’s”?! Disclaimer: I was hosted in Mexico City as a guest of the Mexico City Tourism Office. My opinions, as always, remain my own. Awww Mexico city is so colorful and fun! You captured it so well!